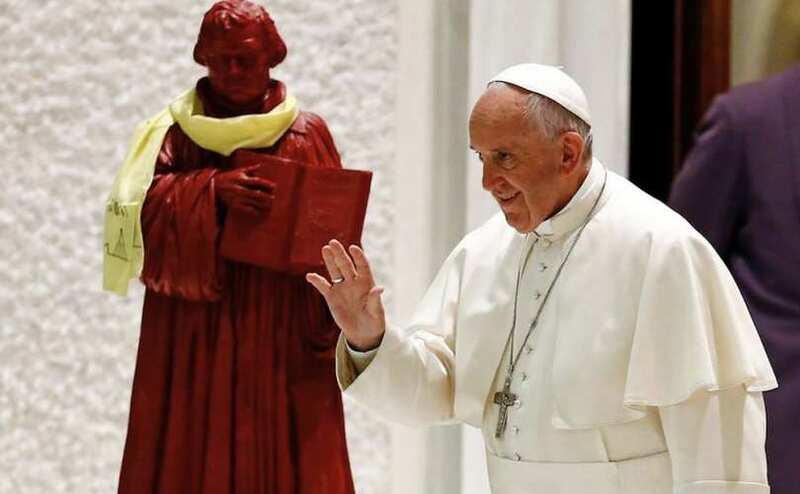 Pope Francis speaking in front of a statue of Martin Luther. Five hundred years ago today, the Augustinian monk Martin Luther famously nailed his 95 Theses to the chapel door of Germany’s University of Wittenberg. And for much of the ensuing half-millennium, the man who begat the Protestant Reformation has been reviled by the Catholic Church. Indeed, the view of Luther among many if not most of today’s Catholics is informed by a polemic written by the not entirely objective Catholic clergyman Henry George Ganss. It was published in the Catholic Encyclopedia all the way back in 1910 and republished on the Internet in 1995. But that was just so much defamation. Luther’s real offense, in the eyes of those who though him a heretic, who believed him justifiably excommunicated by Pope Leo X, is that he had the temerity to accuse the Holy Roman Catholic Church of slouching towards corruption. Luther’s 95 Theses concentrated primarily on the Church’s profane practice of selling so-called “indulgences,” which was the currency of the economy of salvation. While penitent sinners were forgiven and would no go to hell after they died, without indulgences, certificates bearing the pope’s imprimatur, they would still face punishment both on this side of the grave and in purgatory. So it was that Pope Leo ramped up the selling of indulgences to finance construction of St. Peter’s Basilica, sending indulgence preachers to shakedown the Catholic laity. And so it was that Luther decried the Church’s money-changers, who misled the laity into believing that God’s grace could be purchased. The Protestant Reformation Martin Luther begat saved Christianity be eschewing the corrupt practices of the mid-century Roman Catholic Church in favor of a doctrine based on the Five Solas: Sola Scriptura, which declares the Bible alone is our highest authority; Sola Fide, we have been saved through faith alone in Jesus Christ; Sola Gratia, we are saved by the grace of God alone; Sola Christus, Jesus Christ alone is our Lord and Savior; and Sola Deo Gloria; we live for the glory of God alone. 31 Oct	This entry was published on October 31, 2017 at 4:44 AM. It’s filed under THEOLOGY and tagged 95 THESES, MARTIN LUTHER, POPE FRANCIS, PROTESTANT REFORMATION. Bookmark the permalink. Follow any comments here with the RSS feed for this post. Is Pope Francis trying to create a One World Religion? And declaring Martin Luther a Saint just one step in the process? I might add that the Lutheran World Federation- the organization which represented Lutheranism in those discussions- is composed of liberal groups which no longer hold to the historic Lutheran position on a whole range of issues, including quia allegiance to the Lutheran Confessions contained in the Book of Concord. Those Lutheran church bodies which continue to consider them normative have rejected the JDDJ. Except we don’t. The Joint Declaration on the Doctrine of Justification merely agreed on a formula which ignores the fact that the terms “justification,” “grace,” and “faith” each have entirely different meanings in Lutheran and Catholic theology. The Canons and Decrees of the Council of Trent continue to anathematize what we Lutherans understand to be the Gospel itself, and until the Roman church repudiates them- which it cannot do without renouncing its claim to indefectibility- we remain divided on what we understand to be the heart and core of the Faith itself.